YieldCos are a relatively new class of dividend stocks luring in many investors. While many YieldCos offer strong income growth potential, they also come with high yields that average more than 5%. This combination of high yield and high income growth results from YieldCos’ exposure to renewable energy, specifically wind, solar, and hydroelectric power, which have been some of the hottest growth areas in the last few years. As the world works feverishly to make the long-term transition to a clean energy future, global renewable power capacity has steadily marched upward, compounding by 15% per year since 2001. Given that the US Department of Energy’s National Renewable Energy Lab believes that green energy could provide 80% of all U.S. power by 2050, the potential for growth in this exciting industry is both obvious and immense. Of course, there is a huge difference between recognizing a mega-trend and actually being able to profit from it. After all, the green energy industry is littered with numerous heartbroken investor stories. There is no shortage of promising companies that were “the next hot thing” but ended up going bankrupt in this fast-changing, disruptive sector. That’s where YieldCos come in, a relatively new kind of dividend stock that offers potential to let income investors profit from the future growth of clean energy while minimizing the speculative, high risks that have decimated many portfolios over the years. In this YieldCo primer, we will learn if certain YieldCos offer not just a safe, utility-like income stream, but also possess the potential become some of America’s best dividend growth stocks over the coming years and decades. Like Master Limited Partnerships (MLPs) and Real Estate Investment Trusts (REITs), YieldCos are pass-through stock entities designed to allow for generous dividend yields and, at least in theory, strong long-term dividend growth. Think of a YieldCo as a renewable energy utility. A sponsor parent company, utilities or renewable energy firms such as NextEra Energy (NEE), SunPower (SPWR), First Solar (FSLR), and NRG Energy (NRG), build renewable energy projects (wind farms, solar farms, dams, etc.). These sponsors then create a YieldCo, which buys and operates completed renewable power plants from their parent companies. YieldCos raise money from investors to purchase power plants from their sponsors, which get cash they can in turn use to invest in new projects (i.e. cheaper project financing). The renewable power plants operated by YieldCos typically obtain long-term, fixed-fee power purchase agreements (PPAs) from utility companies to buy the clean energy they generate. These PPAs, which are often 15 to 30 years in length, create stable cash flows from which dividends get paid to investors. The important thing to remember with YieldCos is that, like with MLPs, there is a symbiotic relationship with the sponsor. Specifically, the YieldCo, which pays out the vast majority of its cash flow to investors, taps external sources of growth capital (i.e. debt and equity markets) in order to purchase these assets. This allows the sponsor, which acts as general partner and manager of the assets, to recoup the costs of building the renewable energy projects while also benefiting from future cash flows generated by those projects. That’s because the sponsor generally maintains a large ownership stake in the YieldCo and owns the highly profitable incentive distribution rights (IDRs). IDRs allow the parent sponsor to collect 25% to 50% of marginal cash flow once the dividends reach a certain size, creating the incentive to sell (i.e. “drop down”) assets to the YieldCo in order to grow cash flow, and thus the dividend at a quick pace. In this way, a sponsor is able to recoup the construction costs of a renewable energy project while still benefiting from a growing stream of cash flow that can be reinvested into its own business and fuel dividend growth. Essentially, YieldCos are public companies created by renewable energy businesses as a way to raise capital for project development. The appeal of YieldCos is obvious and driven by the growth opportunities made possible by the green energy boom. Simply put, YieldCos’ high dividend yields and fast-growing payouts offer the potential for strong long-term total returns. And the amount of potential growth opportunities in front of certain YieldCo businesses is staggering. 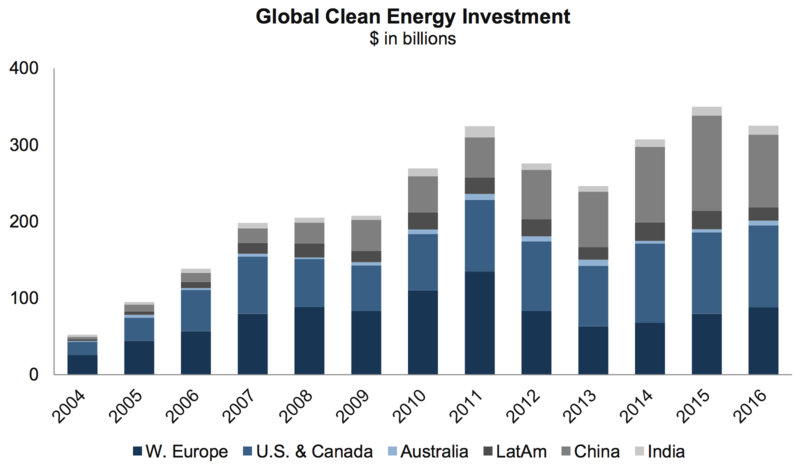 You can see that over the last decade spending on clean energy projects has increased significantly across many developed and emerging countries. "The IEA projects the share of renewable energy in the world's electricity mix to rise from about 24 percent in 2016 to 29 percent by 2022. By that year, therefore, renewable energy output is expected to be bigger than the entire electricity consumption of China, India and Germany combined." NextEra Energy Partners is equally optimistic, noting that the U.S. EIA and research firm IHS are projecting wind and solar to see a substantial increase in market share over the next 10-plus years. While the combination of high yields and solid income growth is tempting, experienced dividend investors know that there is no such thing as a free lunch. YieldCos have a number of key risks that make them more challenging to invest in. While the underlying business model for YieldCos, that of renewable energy utilities with fixed, long-term contracted cash flow, appears low risk at first glance, that doesn’t mean that these stocks don’t come with certain unique risks of their own. First of all, as with any capital-intensive, fast-growing industry there is always the risk that management tries to gain too much growth too quickly and takes on a dangerous amount of debt. This was the fact with the most infamous YieldCos: SunEdison’s Terraform Power (TERP) and TerraForm Global (GLBL). SunEdison went bankrupt in 2016 after taking on over $16 billion in debt in order to grow into one of the world’s largest solar power providers. Unfortunately for investors in TerraForm Power and TerraForm Global, the sponsor’s financial distress resulted in management (which ran both SunEdison and its YieldCos) forcing the YieldCos to not just overpay for assets, but take on dangerous levels of debt as well. This combination of short-sighted thinking, as well as lack of independent oversight from the YieldCo’s management teams, had both TerraForm YieldCos on the verge of bankruptcy themselves, and TerraForm Global was ultimately acquired by Brookfield Asset Management (BAM). This brings up another major risk with YieldCos – the constant need for external growth capital. Because YieldCos’ business models are very MLP-like, in that growth capital is derived from debt and equity markets, YieldCos are often at the mercy of fickle investor sentiment. That’s especially true when it comes to their share prices, which if too low, can result in a lack of the growth capital needed to acquire its sponsor’s assets and grow their dividends at rates investors expect. For example, the SunEdison/TerraForm fiasco was a major black eye for the entire industry and resulted in most YieldCos share prices collapsing. While many have recovered somewhat, most YieldCos are suffering from very high yields, which results in high costs of equity and makes growth challenging. Low share prices may continue to be a major challenge for YieldCos going forward, especially as interest rates rise. Not only do rising rates mean higher debt costs (and thus higher costs of capital), but higher risk-free interest rates generally make high-yielding dividend stocks relatively less attractive, resulting in potentially lower share prices and higher yields. We also can’t forget that much of the recent boom in renewable energy has been due to beneficial tax breaks, which are far from guaranteed in the future. For example, at the end of 2015 the 2.3 cents per kWH Production Tax Credit that had been a major growth driver for the wind industry was extended but only for 2016. The tax credit will decline by 20% each year through 2020. Meanwhile, the solar investment tax credit that allows project developers to write off 30% of the project’s cost was extended through 2018 but will then begin declining until reaching just 10% in 2022. While there is always a chance that these credits may be extended again in the future, that is far from assured and often depends on which party is in control of the White House and Congress. Fortunately, the 2017 tax reform act did not change the production tax credit or the investment tax credit. However, if the economics of renewable energy projects fail to hold up, the distribution growth profile of YieldCos could deteriorate substantially. In addition, consider that the YieldCo business model, which appears to be on solid ground for a good long while, has a long-term risk associated with it. Specifically, one of the very reasons that renewable power has been so successful is its rapid decrease in price. In fact, while the cost of renewables such as solar has fallen by about 66% in just the past seven years, the cost reductions are far from complete. As the technology improves and gains economies of scale, IRENA expects the cost of solar and wind to continue to decline quickly in the coming years. In fact, according to a recent report by Bloomberg New Energy Finance, by 2040 the cost of solar power may decline to just $0.03/kWH, a 77% decrease from 2015 levels. Why is the crashing price of solar and wind power potentially a risk for YieldCos? The reason is because the existing PPAs are for much higher amounts, and the useful life of solar and wind projects is 30 to 40 years. When the PPAs expire, decades from now, the new PPAs the YieldCos will have to negotiate could be much lower than their current levels. That could create a large decrease in cash flows from existing assets and create a long-term growth headwind. Next, consider that renewable energy is less reliable than traditional power sources. After all, wind and solar power can be highly variable, including seasonal variation. Even more stable renewable sources like hydroelectric power, which Brookfield Renewable Partners (BEP) specializes in, can be negatively affected by poor hydrology such as droughts. For example, in both 2015 and 2016 Brookfield Renewable Partners saw its wind farms generate below average power output. Meanwhile, its hydroelectric dams suffered from drought conditions in the Western U.S., but especially Brazil. Such subpar generation can and has had a deeply negative effect on the YieldCo’s cash available for distribution, which pays its distribution. While MLPs and YieldCos share many similarities, there are some important differences when it comes to taxes. For one thing, while MLPs are exempt from income taxes at the corporate level, YieldCos are not. However, because of the benefits of tax credits from their projects, often times YieldCos benefit from a temporary “tax shield” (i.e. they aren’t expected to pay taxes for many years). For example, NextEra Energy Partners expects to pay almost no income taxes for about 15 years, while potentially generating some of its dividends from returns of capital. In other words, its tax credits and high depreciation of assets will mean that dividends are higher than GAAP earnings. This will allow shareholders to defer taxes on this portion of the payout by deducting it from their cost basis. However, while YieldCos can sometimes produce returns of capital, unlike MLPs, which use a K-1 tax form, YieldCos generally use much simpler 1099s (except for Brookfield Renewable Partners Partners, which does issue a K-1). That means less hassle during tax preparation time and also that YieldCos, unlike MLPs, can be safely owned in tax-deferred accounts, such as IRAs and 401(k)s.
Since almost all of a YieldCo’s dividend is taxed as an ordinary qualified dividend at the long-term capital gains rate (see below), the tax rate you pay is generally much lower than your marginal tax rate. First, arguably the most important thing is to check on the management team (i.e. the sponsor of the YieldCo). You need to be able to trust that the YieldCo is run by honest and conservative people who will avoid recreating the cautionary tale of SunEdison/TerraForm. For example, NextEra Energy Partners, 8Point3 Energy Partners, and Brookfield Renewable Partners Partners are run by NextEra Energy Inc, First Solar / SunPower, and Brookfield Asset Management, respectively. Each of these sponsors is among the largest, most respected, and proven management teams in their respective industries. Specifically, they have proven themselves over decades (or more than 115 years in the case of Brookfield) to profitably invest their capital for the long-term, and thus avoid costly mistakes that can blow up your portfolio. While all YieldCos will naturally have high leverage ratios (Debt/EBITDA), the steady, long-term nature of their cash flow usually means that the best quality ones are unlikely to be in danger of falling victim to the SunEdison/Terraform scenario. Extremely high leverage ratios are a red flag that a YieldCo is unlikely to be able to sustain the current dividend, even if their CAFD (similar to free cash flow for a YieldCo) says otherwise. Speaking of cash available for distribution, because of the seasonal nature of both wind and solar power, you want to avoid using any single quarter’s CAFD to determine how safe a dividend is. Instead, you want to use management’s annual CAFD run rate, which smooths out the seasonal variability to see just how well a dividend is covered by its cash flow. A CAFD payout ratio near 90% or below is preferable. Finally, since YieldCos are supposed to be dividend growth stocks, you want to make sure that management is able to deliver on its promise and actually grow the payout over time. NextEra Energy Partners is a good example. The firm has raised its dividend every quarter since its IPO. Brookfield Renewable Partners Partners, the oldest YieldCo in the industry, similarly has an excellent growth record. Most YieldCos have too much financial leverage, shaky payout ratios, and unproven management teams for me to ever seriously consider investing in them. They generally score low marks using our Dividend Safety Scores and appear vulnerable to cutting their distributions over the course of a full economic cycle. However, there are several YieldCo stocks that stand out from the pack. While it’s important to fully understand that these companies still face many of the risks mentioned above (e.g. they are very dependent on issuing stock and debt to grow), they also have a number of more attractive qualities compared to the rest of the YieldCo group. Brookfield Renewable Partners generates the vast majority of its cash flow through very long-term PPAs on its 260 hydroelectric dams located around the world. However, the YieldCo has been diversifying its assets in recent years into wind and solar projects as well. But don’t let that fool you into thinking that there isn’t great future potential in hydroelectric power. In fact, on pure hydro potential alone, Brookfield Renewable’s growth runway is long enough to continue generating management’s targeted total returns of 12% to 15%for decades to come. That’s thanks to Brookfield Asset Management (BAM), the sponsor and manager of Brookfield Renewable Partners. Brookfield Asset Management is the world’s largest and most trusted name in utility and infrastructure assets, with $250 billion in assets under management and 115 years of experience in over 30 countries around the world. When it comes to making highly profitable deals for investors, especially for acquiring great renewable energy assets at fire-sale prices, no one does it better than Brookfield. With Brookfield Asset Management likely to end up acquiring TerraForm’s solar assets, Brookfield Renewable Partners should soon have an excellent opportunity to greatly diversify its asset, cash flow, and geographic base even further. In fact, should Brookfield Asset Management succeed in acquiring TerraForm Power and TerraForm Global, Brookfield Renewable Partners could potentially double its total generating capacity and its cash flow within just a few years. Most importantly, Brookfield Renewable Partners stands out compared to other YieldCos because of its conservatism. As you can see below, the company maintains a lower payout ratio, meaningfully lower financial leverage, is diversified geographically, has an internal operating platform, and understands the importance of total return (rather than just trying to provide the highest yield possible). NextEra Energy Partners is the YieldCo for NextEra Energy Inc, one of the nation’s largest regulated utilities and the number one provider of renewable energy in the country. In fact, NextEra Energy has over 17 GW of renewable energy capacity spread out across North America, which creates a large growth runway for its YieldCo, whose total renewable capacity is only around 4 GW. Wind (59% of generation capacity) is the company’s largest power source, followed by natural gas (19%), nuclear (13%), solar (5%), and oil (4%). With its assets under long-term contracts with an average remaining duration of 18 years, NextEra Energy Partners appears well situated to make the most of its sponsor’s potential 20 GW of renewable energy dropdown backlog – enough to more than quadruple its capacity in the years ahead. That’s especially true given that NextEra Energy cut its IDR fees in half, meaning that NextEra Energy Partners will be able to keep 75% of all marginal cash flow from its acquisitions. That will both serve to lower its cost of capital and allow it to more quickly buy up its sponsor’s vast array of solar and wind projects, ensuring many more years of dividend growth. In fact, thanks to the shareholder-friendly move, management expects to be able to grow the dividend by a very impressive 12-15% a year through at least 2023. Select YieldCos can represent fast-growing, high-yield, and (somewhat) low risk ways to participate in the continued growth of renewable energy. However, income investors should never forget the delicate nature of YieldCos’ capital and operating structures, which can make their stocks especially sensitive to shifts in investor sentiment, as well as the importance of their management teams. As long as you are aware of the risks and take care to only choose the most conservatively financed YieldCos with the most trustworthy management teams, certain YieldCos (e.g. Brookfield Renewable Partners) could be interesting investment opportunities to consider as a small part of a well-diversified dividend growth portfolio.